As a prolific writer, energetic speaker and naturally gregarious person, Theodore Roosevelt used the social media of his day expertly, and if he were alive today he would almost certainly be an early adopter and proficient user of Facebook, Twitter, LinkedIn, Tumblr, Google+, Pinterest and whatever new and great public engagement platform comes along. TR realized very early on that communicating with the public, especially voters, would be critical if he were to be elected and push through the policies he espoused. Perhaps he understood this so well because he was not like most politicians of his day, who typically rose through Democratic or Republican party ranks. TR recognized that although this approach worked for those willing to use the party machines to win votes, he wished to maintain his independence and break free from this corrupt system. The only way to do so, he believed, was to go around the party bosses and get the votes himself, and this could only be done by appealing directly to the public through the then-relatively new medium of the popular press. As TR began his career, newspapers were just coming into their heyday, when on a daily basis they could reach enormous numbers of readers and sway their views on almost everything, particularly politics. This was possible because of major innovations, including invention of the high-speed press, development of photojournalism, and maturation of political cartooning to a fine art. TR took full advantage of this new medium. 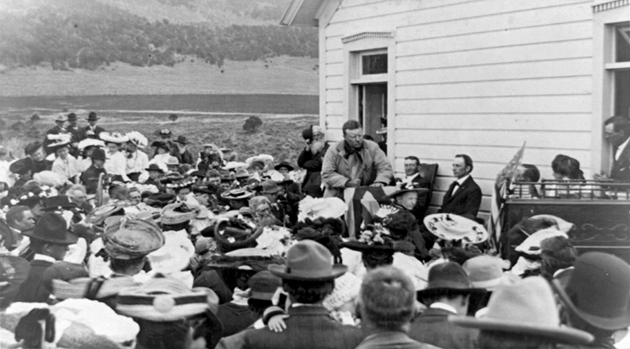 In the days before radio or TV, TR also reached potential voters by appearing in public. He made speeches all over the country. Just as an example, his first speaking trip as president was through New England starting in August 1902. In nine days, he gave more than 100 speeches heard by over one million people. TR knew where his power came from: the people. TR also didn’t neglect a more personal and direct approach through the mature medium of letter writing. However, changes in this ancient mode took place took place during his time. First, the railroads sped up mail delivery dramatically. In addition, by 1900 the U.S. Postal Service provided in nearly 800 cities free residential delivery, as opposed to only the local post office. TR took full advantage of this opportunity, writing some 150,000 letters (no that is not a typo). Given how much TR embraced the communication vehicles of his day, imagine what he would do with social media today. Think of it: writing a blog read by millions; having his own YouTube channel to post speeches and clips of his travels; tweeting his reactions to current events and engaging his followers to join his reform agenda. Politicians today don’t take full advantage of these opportunities, perhaps because they’re afraid of taking a stand on issues that might alienate blocks of voters. TR did and would take a different approach. He said what he believed and didn’t count votes. He would do the same today with our social media, but to much greater effect. Tweed Roosevelt is a great-grandson of Theodore Roosevelt and President of the Theodore Roosevelt Association.